Calcium Phosphate is the best form of calcium accepted the world over. High demand of calcium in the body can be supplemented by Amcalcium Suspension we offer. Amcalcium Suspension that we offer provides the best calcium along with Vitamin B12, Cholecalciferol (Vitamin D3) in a flavored base. Our Amcalcium Suspension is the best for growing children, expectant and nursing mothers. Vitamin B12 is known for its anti-anemic action and it plays a role in the biosynthesis of nucleproteins. Vitamin D3 helps in absorption of calcium and its utilization in bone formation and maintenance of normal neuromuscular function. Calcium Phosphate develops healthy bones, strong teeth, prevents dental carries, prevents rickets and promotes growth. 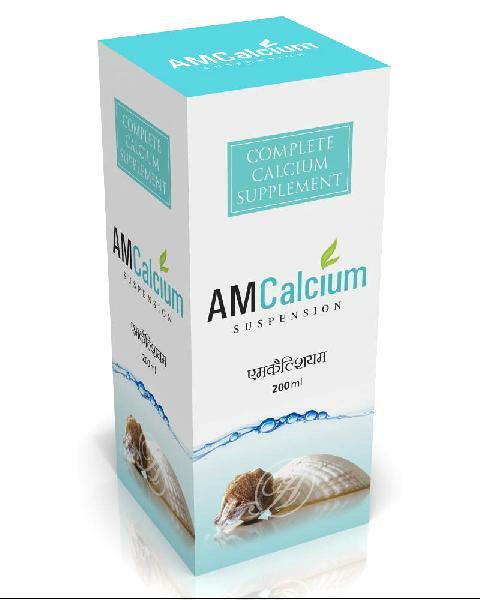 Our Amcalcium Suspension has Di- Calcium Phosphate, Vitamin B12 and Vitamin D3, and is thus very useful in stressful periods like pregnancy and lactation and deprivation of calcium is minimized that can lead to weak bones, osteomalacia, osteoporosis, Tooth decays, etc.